After being drafted second overall in the 2012 NHL Entry Draft by the Columbus Blue Jackets, expectations were high for Ryan Murray. He was expected to be a substantial presence and a leader of the defense corps. However, mainly thanks to multiple injuries, many feel that he has not lived up to the billing of a second overall pick. Then, when the Seth Jones and Zach Werenski pair began to lead the Blue Jackets’ defense, some considered Murray a bust. However, this season could be the start of a new chapter in his career. Thus far, Murray has accumulated 25 points in a season once since he started his NHL career in 2013-14. That occurred in 2015-16, which also happens to be the only season in which he appeared in all 82 games. Despite the career year for the once-projected defensive cornerstone, the Blue Jackets floundered and finished eighth in the Metropolitan Division. I’m sure most fans still remember the sting of the 0-8 start. The 25-year-old has suffered through broken bones, a knee injury and a back issue that kept him on the sidelines a large part of last season. These injuries have not only kept him out of the lineup but also hindered his development as he was unable to practice and play with any consistency. The 2018-19 season appears to be a career rebirth for Murray. If he manages to stay healthy, this season will easily be the best of his career. Through 41 games, he already has one goal and 20 points. He is a plus-15 and is averaging nearly 22 minutes of ice time per game. His plus/minus rating is the second-best on the team, behind only forward Josh Anderson’s plus-18. Currently, Murray’s 16 assists are good enough for sixth in the league among defensemen. Serving on both the power play and penalty kill units further shows that he is finally emerging as a steady force. For comparison, last season he only tallied 12 points in a total of 44 games on the season. In his rookie year of 2013-14, he managed 21 points in 66 games, which is his second-highest point total. Perhaps one of his most significant upsides is his ability to read the play and make sharp passes to help set up key plays. A great example was during the 4-2 win over the Toronto Maple Leafs on Nov. 23. When pinned back in their defensive zone, Murray, along with Pierre-Luc Dubois and Jones, force the turnover from the Maple Leafs’ Mitch Marner. Murray picks the puck up and sails it down the ice to Artemi Panarin. This play directly leads to a goal by Markus Hannikainen, putting the Jackets up 4-2. Notice his defensive partner on that play was Jones. Earlier this season, head coach John Tortorella switched up the defense pairs to spur some confidence in an underperforming Werenski. Despite his partner, Murray has stayed consistent. His play has been impressive this season, and his consistency has been rewarded. Sometimes it is hard to forget that he is only 25 years old. 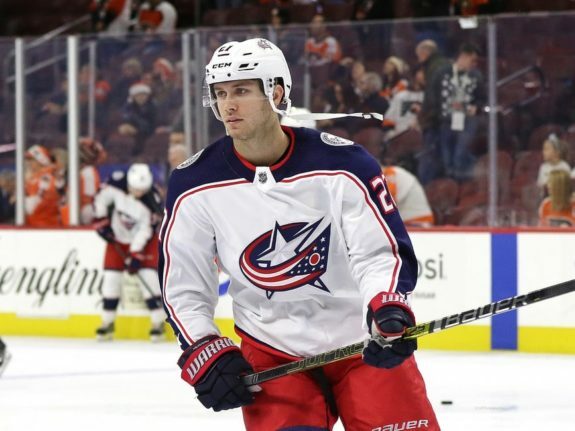 His growth this season can be a catalyst in helping bring some consistency and stability to the Blue Jackets’ blue line. Despite all of the talk about his potential and lost time, Murray has seemed to have risen above it all. He is playing a solid game and making the players around him better as a result. Will the confidence last? If the team wants to continue to make a run toward the playoffs, they will need Murray to keep going on the same pace as the first half of the season.